The conference TV deals scored by the SEC and the Big Ten continue to get better. Not so much for the Pac-12, where operating deficits are as common as complaints about the Pac-12 Networks. While Huskies fans were busy speculating on the football abilities of 17-year-old boys last week, some news came out of the Southeast that told a less-thrilling tale about Pac-12 Conference sports — if you care about the arms race that is slowly rotting big-time NCAA sports. According to tax returns provided by the Southeastern Conference to USA Today, the SEC had revenues of $639 million for fiscal year 2016, from which it made a distribution of about $40 million for each of the 14 member schools. 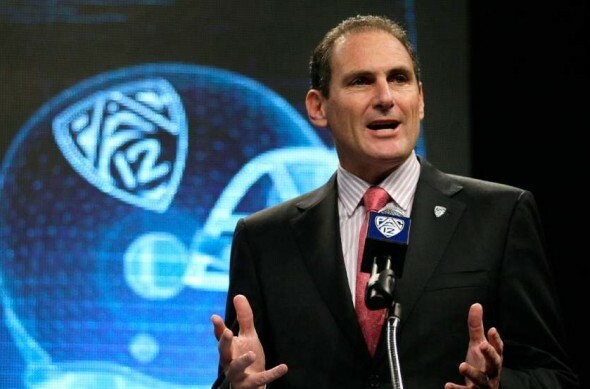 By comparison, the Pac-12 in its most recent figures — they don’t release FY 2016 until May — distributed $25.1 million to its 12 members, according to reporting by Jon Wilner of the Mercury News. The Big Ten was distributing $32.4 million to its 14 schools in the same period. The primary cause of the disparity was TV revenues. As you may have read over the past five years of reporting on TV channels created by the Power 5 conferences, the Pac-12’s decision to own and control its propaganda arm, the Pac-12 Networks, rather ceding ownership to ESPN and Fox Sports, as the SEC and Big Ten have done, has not worked out well. Defensively, the Pac-12 office says its arrangement is providing the schools benefits, such as recruiting exposure, that don’t show up on the spreadsheets. Network president Lydia Murphy-Stephans said revenue comparisons are misleading. “We’re seven networks,” she told the San Fransisco Chronicle. “We’re managing athletic (websites) for the schools. We’re producing content for each of the universities. We’re owned by the universities. We’re an extension of the conference and the universities. That is probably true. And it is exactly the reason revenues aren’t prospering. Since inception, the Pac-12’s failure to get satellite provider DirecTV to carry the channel has been a Hindenburg-class mistake. Because the Pac-12 includes six geographically large, less densely populated states, satellite delivery is much more successful than terrestrial cable. You try getting a cable truck to East Bugthorpe, Utah. The reason DirecTV keeps saying no on behalf of its 22 million subscribers is simple, according to a source familiar with the staunch refusal to pay carriage fees the Pac-12 Nets scored from cable systems when they thought Pac-12 content was attractive to large numbers of sports consumers. Murphy-Stephans’ remarks seem to make that very point. Pac-12 Networks covered more than 850 events in 2016, but the audience for the non-revenue sports of baseball, softball, volleyball, etc., is confined largely to potential recruits, current athletes and members of their families. So unless the Pac-12 lowers its price to DirecTV, distribution is stuck. And if the conference did lower its charge, the cable companies would demand make-good deals to match. The seven channels of the Pac-12 Networks (independent of the revenues from ESPN and Fox) paid each school $1.5 million in 2015, and Wilner forecasted a bump to about $2 million in 2016. The numbers are well short of what was anticipated. WSU’s athletic department reported a deficit of $13 million in each of 2014 and 2015. Washington reported a $14.8 million deficit for 2015. Other Pac-12 schools are also running deficits. Fans who care only about their schools’ game outcomes are missing a point. When Washington considers the basketball coaching fate of Lorenzo Romar, whose team is about to miss the NCAA tourney field for the sixth consecutive season, it must consider that the buyout in his contract, which runs through 2020, is $3.2 million after this season. While it’s true that UW athletics has a reserve fund that was up to $30 million at one point, it’s also true that the increased cost of providing scholarship athletes the full cost of attendance, as well as continuing legal setbacks for the NCAA in student-rights litigation, means that giving a coach $3.2 million out of the reserve fund to go away is a serious matter. Especially when football coach Chris Petersen is likely in line for a contract extension and raise after his team reached the College Football Playoffs in his third season. If the expectation now is to go into gunfights regularly with the likes of with SEC powers such as Alabama, Petersen is going to request his bosses provide him with more than a knife. At some point the Pac-12 is going to have to realize the way it has done its TV business isn’t working, or risk falling back among the have-nots in the ruthless industry of big-time college sports. Amazing these programs are running at a deficit for what fans pay in donations, ticket prices, cable rates & revenue the colleges receive from the networks. The Big Ten and SEC seem to have it figured out but not the Pac 12. Part of the problem is that we here on the West Coast actually have things to do with our time that aren’t obsessing about ultimately meaningless distractions like sports being played teenagers. The Pac-12 invested heavily in facilities upgrades before they knew the rev stream from their TV channels. Econ 101 will tell you that’s bad bidness. Not ready to go there, but I will admit to being creeped out by the whole recruiting process, especially by those outside football programs. Pac-12 network is mismanaged. It is still not picked up by Direct TV. Direct TV stating that the fees are “not worth it.” I get it on Comcast and like too much of the left coast it is politically correct. That is, a conscience decision has been made to try to showcase women’s sports equally with men’s. Fine. Then don’t expect to make money with it. Call it a non-profit. They need to set their priorities to make money if that is what they need. Run infomercials, reality shows, reruns of Andy Griffith if it makes them money. On Comcast, they recently switched Pac-12 Washington to standard definition TV. They have yesterdays technology at tomorrows prices. The generic Pac-12 network is still in HD, though. As I pointed out, the schools are using it as a recruiting tool rather than a profit center. As you point out, to make money, they need more content, like Seinfeld reruns. Indeed, they need to make up their minds. Are you The Donald? Let’s see. Pac-12 WA has always been standard def on Comcast; what they did do within the last year is put Pac-12 WA on a higher tier than the national Pac-12 Network channel, which is Hi-Def and has always been. Your claim of ‘politically correct’ is bushwah. Most damning of all: the word is “conscious” not “conscience”. Twit.